In 2009, Disney released The Princess and the Frog, which had a lot of pressure from unprecedented anticipation, as this was to be the first Disney Princess film with a black princess. Most audience members were extremely happy with the film, and critics were as well; the film scored an 84% on Rotten Tomatoes and a 73 on MetaCritic, both of which are impressive scores. While it had success as an animated film, a Disney film, and a princess film…how does it stand as a black film? I recently took AAAD A278 “Contemporary Black Film” which sparked a lot of interest for me to explore The Princess and the Frog, using “black film” as a magnifying glass to inspect it. Really, the one thing that this film should have done is appeal to young black girls as the white princess did for the young white audiences, but taking away all sense of #BlackGirlMagic loses it’s appeal to a large portion of the black audience who came to see The Princess and the Frog – not A Tale of Two Frogs. 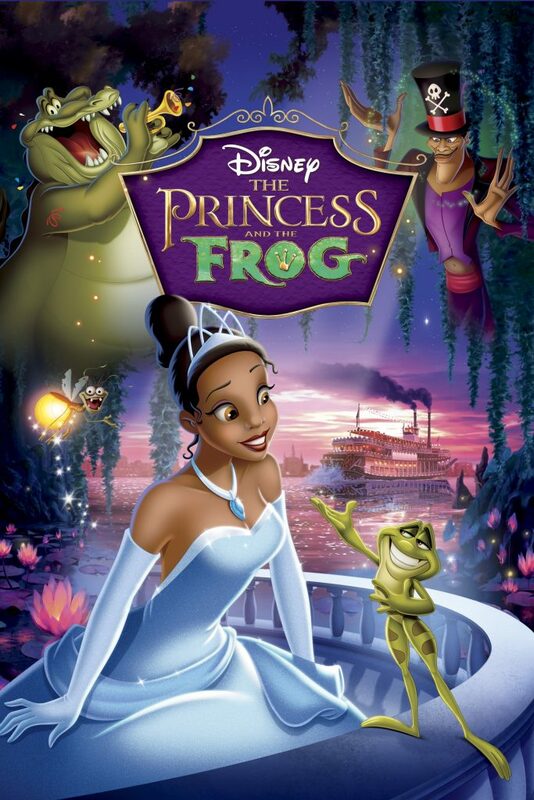 A lot of people remember this film as “the one where the black princess got to be a frog for the whole movie,” but it’s even more than just that. One article we read, titled “Black Film as a Genre,” defines them as “motion pictures made for theater distribution that have a black producer, director, and writer, or black performers; that speak to black audiences or, incidentally, to white audiences possessed of preternatural curiosity, attentiveness, or sensibility towards racial matters; and that emerge from self-conscious intentions, whether artistic or political, to illuminate the Afro-American experience,” and in using this definition, how does the film hold up? Without further ado, let’s break this down. By my count, there are 13 princesses in the Disney Animation and Disney/Pixar films: 1. Snow White in Snow White and the Seven Dwarves (1950), 2. Cinderella inCinderella (1950), 3. Aurora in Sleeping Beauty (1959), 4. Ariel in The Little Mermaid (1989), 5. Belle in Beauty and the Beast (1991), 6. Jasmine in Aladdin (1992), 7. Pocahontas in Pocahontas (1995), 8. Mulan in Mulan (1998), 9. Tiana in The Princess and the Frog (2009), 10. Rapunzel in Tangled (2010), 11. Merida in Brave (2012) and 12 and 13. Elsa and Anna in Frozen (2013). Based on the acquisition of their status of “princesshood”- I divided into these 13 girls into two categories: those who became princesses by birthright, and those who became princesses by marriage; there are only four of these 13 girls who were not princesses at birth, and were instead had to work for their crown (disclaimer: when mentioning “royalty” or “princesshood,” I do not always mean that these girls were actually royalty in the traditional sense, but rather at the top of their respective hierarchy in their kingdom, whatever that may be). 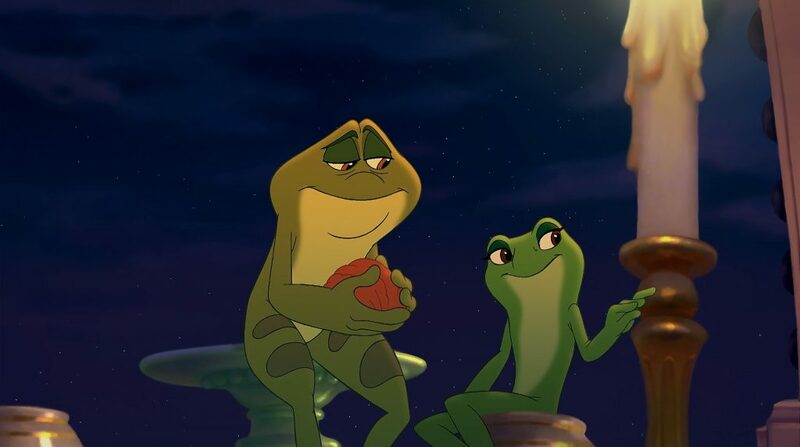 In this way, The Princess and the Frog differs from all other films moreso than just the inclusion of the first black Disney “princess”; this movie actually contains a white princess who was meant to marry the prince, Naveen, but was unable to do so as the prince was turned into a frog by the antagonist in the film. Because of this occurrence, Naveen hops into the window of the princess’ room and tries to kiss the girl to break the spell. 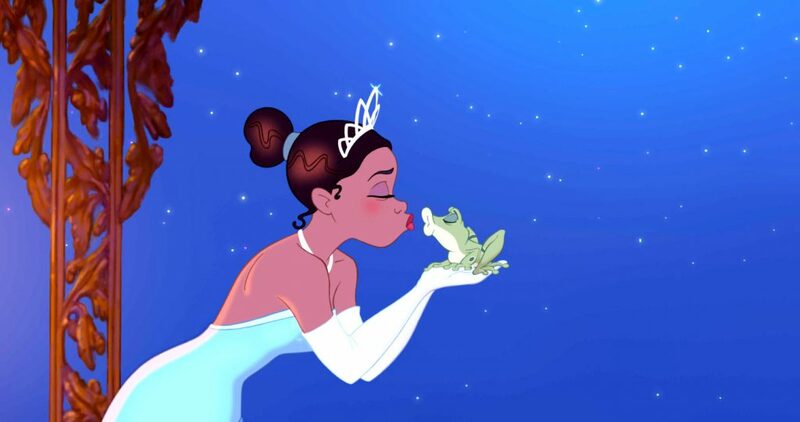 Alas, he kisses Tiana instead of the real princess, at which time Tiana turns into a frog and must discover a way to turn back into a human in order to fulfill her father’s dream. Side note: A classmate of mine, David, noted that her father told her at the beginning of the movie that food brings people together and makes people happy, which is important. Tiana misses the point completely as she only literally takes his advice, which is to make people food but doesn’t understand that it’s the purpose of the food and not the food itself that’s important: the sense of community that comes with sharing food with friends. Tiana’s transformation insulted, or at the least disappointed, many people who were looking forwards to seeing Disney’s first black princess, and were instead given a film about a frog who used to be a girl (skin color really isn’t touched upon in this film). “Black Girl Magic is a term used to illustrate the universal awesomeness of black women. It’s about celebrating anything we deem particularly dope, inspiring, or mind-blowing about ourselves” is how Julee Wilson defined the social media “#BlackGirlMagic” which has become extremely popular. The Princess and the Frog should have at least made young black girls proud of the character who was supposed to have been their first representation in the Disney princess series, but instead they were left with a slimy- I’m sorry, “mucus-y”- frog to portray the character. The only other princess who transformed in the films I mentioned was Ariel in The Little Mermaid, but by transforming, she became a gorgeous human with legs instead of a mermaid with a tail fin: quite literally (as in, in the dictionary definition sense) this transformation sexualized Ariel. I’m not sure how mermaids reproduce but I see no obvious genitalia, so if I had to assume, I’d say asexually. Because of Ariel’s transformation, she was literally sexualized by becoming a woman who could mate with a man- not a transformation to complain about. Tiana on the other hand, was desexualized when becoming a frog (even though they reproduce sexually) she is now unattractive to the male population (I assume), except for the one “male” whom she’s stuck with. While Prince Naveen seemed to be attracted to her upon first meeting her (when they first kissed in the house), he seemed to be quite the womanizer, and only seemed to want to kiss her out of necessity to turn back into a human. 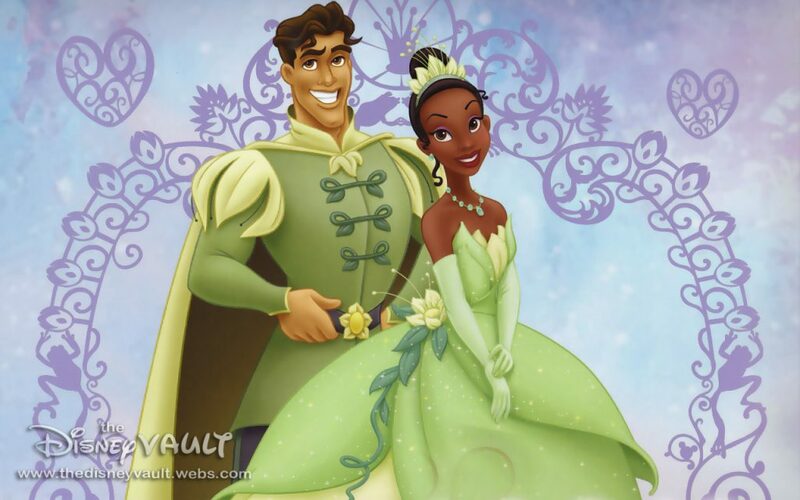 So, is Prince Naveen actually attracted to Tiana as the person she was before turning into a frog? The world may never know.